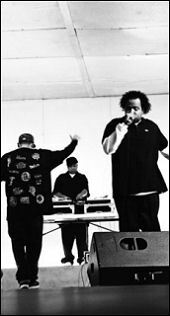 These are the transcripts of an interview with Dilated Peoples aired March 26th, 2006 on DJ Hyphen & J. Moore's "Sunday Night Sound Session" on Seattle's KUBE 93.3 FM. For more info. on DJ Hyphen click here. MVRemix: The album came out, so how has the response been to it from critics... from listeners... from the industry? Evidence: Across the board its been great man. Probably the most critically acclaimed we've ever had. It's funny, everybody's talking about "The Platform" was this, that and the third, but when the reviews came out - it was like "3," "3 1/2." Everyone looks back on it... We got 4 mics in The Source, 4 in Elemental. We're loggin' onto MySpace and cats are sayin' nothin' but great things. So if you get a couple haters out there and you talk to them, they end up being fans regardless. Can't please everybody all of the time, but for the most part I feel this has been one of our most successful campaigns as far as the fans and the critics go. MVRemix: What's the main difference between this album and the last? Evidence: I would just say that with this record we really went in not questioning who what we do, just understanding who we are and what we needed to provide to the people. We set up a studio in Los Angeles, just us three in the room. No windows, no engineers... nobody. It was just us three bangin' out like a band would in a garage, you know? The analogy I've been using a lot is the boxer going back to train in his old neighbourhood. We had money to make the record, but we didn't treat it as such. We just, for lack of a better term, kept that independent mentality - that ABB 12" mentality. It sounds like that man; it has a great feel from beginning to end. Rakaa Iriscience: As far as I'm concerned man, there really wasn't that much difference. I think what it comes down to is the campaign. With the last record we had a plan and had it been followed, it would have shown this is just part of the continuum. This is just something that we keep doing. I think what happened last time is that a lot of people got real excited, they had the opportunity to make their job a little easier so they jumped on the situation and lost sight of the big picture. I think with this one, the only difference I'd say is in our business; we took control of it. We directed management instead of letting them directed us, we directed the label like we have always done throughout our career. I think the most important is this one; we took control back over the campaign. But creatively speaking, it's not much different. We talk about what we want to talk about, pick the beats that sound good at the time and make the songs that sound right. We come out the studio and we're happy with them, so... it is what it is. Evidence: I think it's a great representation, a great place to start. MVRemix: And then go back and do their homework? Evidence: Any which way you know. It's not people's fault if we knocked out our other ones when they were young. I just feel this is a great representation of where we are and how we've grown. If this is the first LP you're gonna get with us, I think it's a great place to start. MVRemix: Speaking of starting and evolving, what's going on in the L.A. underground scene in terms of is there anybody that you're checking for? Who's next basically? Rakaa Iriscience: There's all types of things happening. Being in L.A., and living in L.A. - not just seeing what the video people put on L.A. Whatever the case may be, it's always been diverse man. Dilated's been doing it for a long time, but we came in the game with the love from a lot of people like the Soul Assassins movement, which is still in effect... The Likwit Crew; my man Defari is on tour with us right now - lettin' us know that it's a family affair. Big up to the whole Alkaholiks. The Project Blowed, which used to be The Good Life family - I know those cats are still doing things - I know the Good Brothers record was out. As far as new cats, Planet Asia is down in L.A. He's from Fresno, but he's in L.A. so he's an L.A. cat as far as we're concerned. Strong Arm Steady that's Krondon... Krondon's on the record, but that's Krondon, Phil The Agony, Mitchy Slick and Xzibit. So a lot of people are doing big things. Evidence: I can't really tell what underground is anymore because to some people the fact is that we have a video on MTV or the fact that we're on the radio station talking. To other people who may have mainstream or platinum success, they look at us like we've only scratched the surface. I don't really know what that is, I just learned that you've got to find your lane and connect with your people and that's what we're doing. MVRemix: Speaking of some of those other acts. Babu, I know that you and Defari did the Likwit Junkies album - is there any plan to do a follow up to that? Babu: Definitely. Right now we're focused on doing this "20/20" thing but definitely you're gonna see a sequel to the Likwit Junkies record, and of course D[efari]'s getting ready to put out his new record real soon; "Street Music," so look out for that. MVRemix: When is the Babu and Evidence production record coming out? Evidence: It's here man! It's the "20/20" LP [chuckles] - right now. Babu and myself did the majority of the album, so it's an in house record. Alchemist did two joints and Joey Chavez and Bravo did two. MVRemix: We played "Back Again" when it dropped late last year and then we played the "You Can't Run, You Can't Hide"
Evidence: [interrupting] "You Can't Hide, You Can't Run." MVRemix: Oh sorry, I got it reversed, my bad... Then also the "Kindness or Weakness" joint with Talib [Kweli]. I think this is the second or third time you've worked with Talib, how did you usually hook up? How did you hook up with the Okayplayer fam? Was it something like that? Rakaa Iriscience: We linked up with Okayplayer, strictly originally to do web stuff. Up until that point I had been designing and hosting the sites myself. When we did the deal with Capitol, we decided that a stronger world wide web presence was need. So there were a couple of people that came to the table and Okayplayer had something that Capitol didn't have - it was a very soulful, colourful demographic that was missing from Capitol's rolodex at the time, and Okayplayer filled that up real nicely. We're not with Okayplayer anymore, but that's still family. Big up to everybody from Okayplayer that supported us along the way. It was something that was real important to us - getting into the consciousness of people that Capitol couldn't really get us into the consciousness of. As far as connecting with Kweli, we actually met up with him I think even before he was on Okayplayer. We did a tour; Dilated Peoples and Hi-Tek and Kweli - they had the Reflection Eternal project they were doing. We did a tour, I think it was like 2000... And that was the first time that we actually collaborated on anything, it was actually on tour. We did a "Live On Stage" remix and there was actually little things around the way. This I think is the first time he did something on a full length joint with us, so it's real cool man. With Kweli it's a lot of love. Support him too, he's doing his thing.